I've read one Justine Larbalestier book, How to Ditch Your Fairy. I thought it was quirky, fun, and I know it would have appealed to teen me (I was a very dedicated teen athlete as well as a bookworm, and I never thought there were enough books for my demographic - especially books featuring girls-who-play-sports!). I also checked out the short story collection Zombies vs. Unicorns, which she co-edited with Holly Black. Those (positive) reading experiences led me to Larbalestier's blog and Twitter, and I've found that she's articulate, funny, and interesting on social media as well as a great writer of fiction. So I was quite disappointed when I heard that her latest book hadn't sold in the U.S. It seemed like pure bad luck. But hey, that's changed! It's coming! I'm super stoked. Razorhurst will be released by Soho Teen on March 3, 2015. Sydney’s deadly Razorhurst neighborhood, 1932. 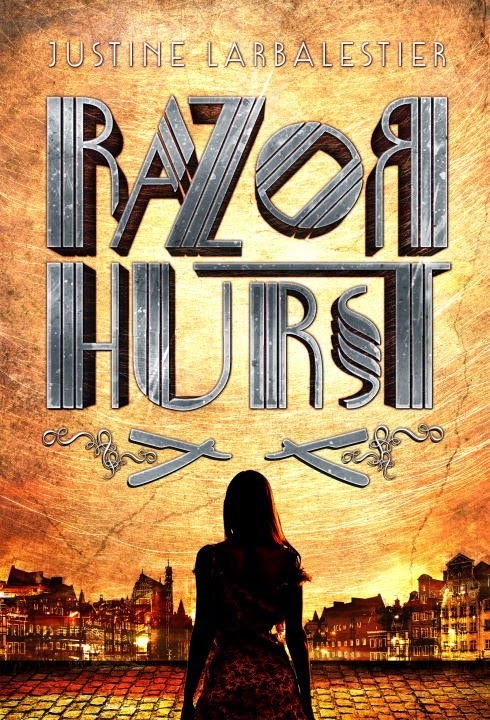 Gloriana Nelson and Mr. Davidson, two ruthless mob bosses, have reached a fragile peace—one maintained by “razor men.” Kelpie, orphaned and living on the street, is blessed and cursed with the ability to see Razorhurst’s many ghosts, and she sees the cracks already forming. Then Kelpie meets Dymphna Campbell. Dymphna is a legendary beauty and prized moll of Gloriana Nelson. She’s earned the nickname “Angel of Death” for the trail of beaus who have died trying to protect her from Mr. Davidson’s assassins. Unbeknownst to Kelpie, Dymphna can see ghosts, too, and as Gloriana’s hold crumbles one burly henchman at a time, the girls will need one another more than ever. As loyalties shift and betrayal threatens at every turn, Dymphna is determined to not only survive, but to rise to the top with Kelpie at her side—and to save Kelpie from both the living and the dead. Sounds like an interesting story. I will have to keep my eyes out for it as it gets closer to release. I don't love Larbalestier, but this one sounds cool.